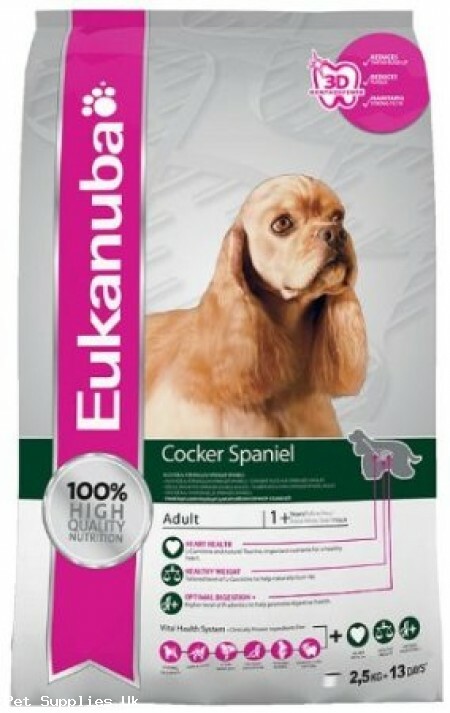 Eukanuba Cocker Spaniel is specifically made to nourish a Cocker Spaniel’s overall health. It has protein-rich chicken as the number one ingredient, and is made with wholesome grains to help maintain a Spaniel’s playful energy levels. FOS, a natural prebiotic, is included to support your Cocker Spaniel's strong defenses from within the digestive tract. Additionally, this food is rich in fish oil to support a Spaniel's luxurious coat. Glucosamine and Chondroitin Sulphate are also included to support their healthy joints and mobility. Feeding Eukanuba Cocker Spaniel will help keep your dog as healthy and vibrant as he was bred to be. Eukanuba Cocker Spaniel includes important nutrients Taurine + L-Carnitine to help maintain a healthy heart. Eukanuba Cocker Spaniel has tailored levels of L-Carnitine to help naturally burn fat. Eukanuba Cocker Spaniel has a higher level of prebiotics to help promote digestive health. FOS (fructooligosaccharides) prebiotic works in your dog's digestive tract to support his strong defenses. Made with antioxidants such as Vitamin E to support your dog's immune system. Natural fish oil provides omega-3 fatty acids for healthy skin and coat. Your dog deserves the best, so there’s no room for fillers like artificial preservatives, artificial flavours or colours in our food. In fact, every carefully chosen ingredient serves a specific purpose in promoting your dog’s overall health. It’s our 100% commitment to you and your dog. Made with highly digestible barley and grain sorghum to help maintain healthy blood sugar and energy levels. Crunchy kibbles with a coating of micro- crystals scrub your dog's teeth with every bite, reducing plaque and tartar buildup that can lead to bad breath. The high-quality ingredients found in Eukanuba are selected based on the nutritional benefits they provide for your dog. And that also holds true for the ingredients that make up Eukanuba’s Vital Health System. Whether it’s natural protein, fat, calcium, or fiber, Eukanuba formulas have the right blend of ingredients for a specific breed, life stage, and lifestyle, to make them essential to your dog’s diet. Clinically proven prebiotics help promote strong natural defences. 65% of your dog’s immune system is found in the digestive tract. Every day, dogs are exposed to plenty of factors that can have a negative effect on their overall health. Which is why it’s important to feed them nutrition that helps build up strong defenses against the elements – like the nutrition inside every one of Eukanuba’s formulas. A dog's first lines of defense are his barriers like his skin and coat and the lining of his digestive tract. And his second line of defense is the biological action of his immune cells and antibodies. That’s why Eukanuba is rich in antioxidants like vitamin C, vitamin E and beta-carotene, which help support his immune system now and in the long run. The clinically proven Prebiotic FOS in Eukanuba supports strong defenses. The digestive tract is an important part of a dog’s defense system, and almost 70% of a dog’s immune system is found in the digestive tract. One of its roles is to maintain the balance between good and bad bacteria. So it’s good to feed your dog a diet rich in Prebiotics, because it helps promote good bacteria while at the same time reducing the bad. Your dog’s coat makes him look magnificent and feel great too. And his skin and coat play a vital role in protecting him from injury and germs, keeping him warm and acting as a first line of defense. All great reasons to give him nutrition focused on protecting him. Eukanuba is packed with important ingredients for a healthy coat like high quality animal protein from chicken, lamb, fish, and egg. These proteins are especially helpful because 30-35% of a dog’s daily protein intake is needed just to keep his skin and coat in good condition. Essential amino acids, vitamins, minerals and special nutrients also support coat health. Animal based-proteins like those found in Eukanuba have been clinically proven to promote strong lean muscles in your pet. Feeding a premium diet like Eukanuba in conjunction with regular exercise encourages good mobility and functionality. With good nutrition playing a key role in maintaining a lean body mass, you can ensure that your dog stays in good shape and enjoys an active life. Eukanuba's animal-based proteins like chicken and lamb contain a complete amino acid profile, and are clinically proven to promote strong lean muscles. And when you combine Eukanuba's 100% complete and balanced nutrition with regular exercise, you're encouraging good mobility and function in your pet. It also contains L-carnitine, a natural fat burner – to help burn fat. A dog's nutritional needs and digestive capabilities are significantly different from humans. To help his all round well-being, he requires a diet that provides digestible ingredients like protein found in chicken, lamb, and fish, as well as fat, vitamins and minerals. All of which are in abundance in Eukanuba formulas. Eukanuba contains beet pulp, which is effective in supporting digestion. Beet Pulp promotes healthy digestion by providing nourishment to intestinal cells. It has also been shown to improve stool quality and promote nutrient absorption. Nutrition plays a vital role in bone and joint development and maintenance throughout a dog's life. That's why it's especially important to feed your Eukanuba. It has nutrition tailored to breed size with the correct balance of nutrients to help support bone and healthy joints so that your dog enjoys an active life. Eukanuba diets have omega-6 and 3 fatty acids at a ratio of 5-10:1 to support healthy joint cartilage. They also contain ingredients that provide optimal energy and calcium levels to help promote good bone development, natural sources of glucosamine and chondroitin sulfate, natural building blocks of healthy cartilage, and high quality animal based proteins to maintain muscle mass and help support joints. Dogs have vastly different growth rates. This means that a giant breed puppy has an extremely rapid growth rate when compared to a small breed puppy. Large breed puppies are more sensitive to nutrient caloric excesses. Normal bone and joint development relies on correctly balanced nutrition both in terms of energy levels and optimal calcium levels tailored to breed size. Eukanuba Diets have omega-6 and 3 fatty acids at a ratio of 5-10:1 to support healthy joint cartilage. Tartar deposits are much more difficult to remove than plaque and form a rough surface for more plaque to adhere to. Together, plaque and tartar can lead to significant oral problems for dogs - including bad breathe, gum inflammation, loss of teeth, and eating difficulties. When you feed your dog Eukanuba, DentaDefense plays an important role in maintaining a healthy mouth. Eukanuba's DentaDefense HMP system offers a dual action cleaning benefit. During his meal, crunchy kibble helps remove deposits from your dog's teeth. After he eats, special minerals keep tartar-forming materials from attaching to his teeth. In fact, Eukanuba's DentaDefense system is clinically proven to reduce tartar build-up by an impressive 55%. Which is a good thing, because by the age of three, almost 85% of dogs show signs of dental/oral issues. The Cocker Spaniel is an elegant breed renowned for his pleasant attitude and a happy wagging tail. In order to maintain weight control and support a healthy skin they can benefit from tailored nutritional care. Eukanuba Cocker Spaniel is a complete and balanced daily food designed to help manage weight, promote healthy skin and a luxurious coat.